Over 46 million people face economic obstacles that keep them living in poverty. 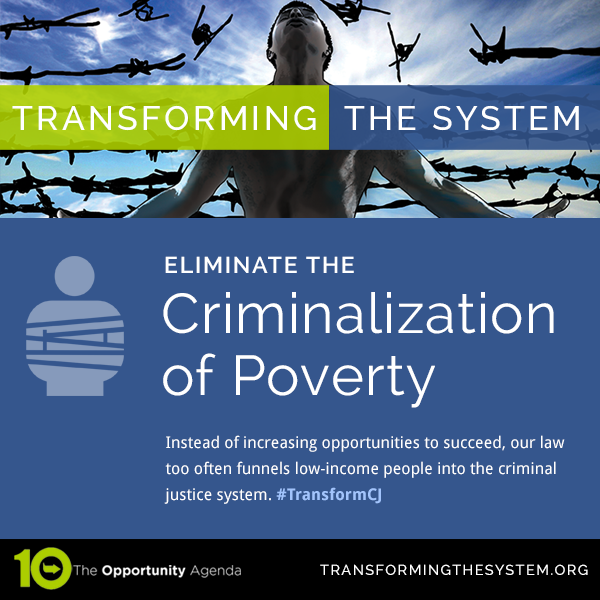 And instead of increasing opportunities to succeed, our law too often funnels low-income people into the criminal justice system. Debtors’ prisons – the jailing of people for nonpayment of court-imposed fines or fees without prior procedural protections – have emerged around the nation, despite clear Supreme Court precedent holding that such prisons violate constitutional rights to due process and equal protection of the law. Low-income people are saddled with cripplingly high fines and fees for minor traffic tickets, civil offenses, and even misdemeanor crimes that are not normally punishable with jail time. 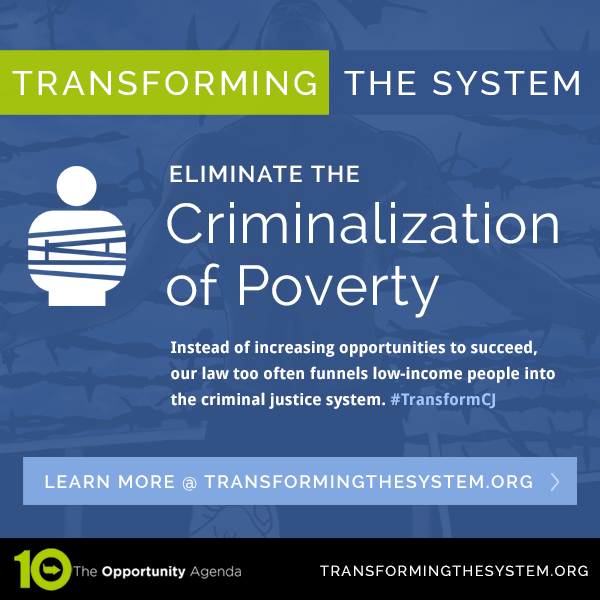 When they are unable to pay, they experience devastating consequences, including incarceration, that affect their future employability, family stability, and communities. People are also criminalized for homelessness through overly broad local vagrancy, loitering, and encampment laws that lead to ticketing, fines, and even arrest. Additionally, people who are sentenced to jail for their crimes are frequently charged fees related to their incarceration and a host of other penalties that lead to the escalation of their fines and fees during their prison terms. As a result, released persons, who have already paid their “debt” to society by serving their time in prison, face overwhelming and growing debt burdens. A 2015 Brennan Center report found that 43 out of 50 states have statutes that charge incarcerated individuals “room and board” fees. These debts are often sold to debt collection agencies that charge additional fees and interest on unpaid fines and fees, and adopt aggressive collection practices toward individuals who have only recently been released from prison and are struggling to regain their footing in society. The criminalization of the poor is exacerbated by state and local governments’ use of for-profit probation providers to collect unpaid fines and fees. When courts fail to afford counsel to people facing jail time for nonpayment, they may also violate constitutional rights. Everyone deserves a second chance, yet these practices create a perpetual state of financial servitude for many who have already served their time. Local and state governments should repeal legislation authorizing the imposition of user fees, including public defender fees; repeal legislation imposing mandatory “assessments” for both criminal and civil offenses; review municipal and state court procedures and rules to ensure that fine and fee collection comports with constitutional protections for due process and equal protection of the law, so that people are not jailed for non-payment of civil fines, fees, and/or penalties they cannot afford to pay; ensure that counsel is appointed at the sentencing and post-sentencing enforcement stage whenever a person faces incarceration for nonpayment of a fine or fee; and eliminate incarceration and jailing for civil penalties and fines including for child support. The Department of Justice (DOJ) should investigate and bring enforcement actions against debtors' prisons that touch on areas in which DOJ has authority such young people. Debtors' prisons – the jailing of people for nonpayment of court-imposed fines or fees without prior procedural protections – have emerged around the nation, despite clear Supreme Court precedent holding that such prisons violate constitutional rights to due process and equal protection of the law. The task of determining whether an individual can pay fines has frequently been outsourced to for-profit probation companies that often recommend that individuals be incarcerated for failure to pay fees or fines. Legislatures should eliminate the use of probation administered by for-profit probation companies to collect payments toward fines and fees. Courts should establish debt payment plans for the repayment of criminal justice debts. Local and federal governments should set caps on criminal justice debt and provide a clear statutory right that allows the court to waive the fees and fines of low-income individuals related to their involvement in the justice system. Courts across the country routinely incarcerate individuals for failure to pay criminal justice debt without regard to the financial circumstances that may make payment impossible. In general, fines and fees should be avoided. Judges should not impose interest and additional fees on people who cannot afford to pay in full on sentencing day. Local and state governments should prohibit law enforcement from profiling individuals on the basis of perceived housing status and invest in more comprehensive long-term and short-term housing options, ensuring that housing placements respect individuals self-identified gender specifications. Local and state governments should improve police training on interacting with homeless communities, including police training curricula to improve relationships with LGBTQ youth and decrease profiling, harassment, and abuse. Local and state governments should enact an enforceable Homeless Bill of Rights that ensures that homelessness is not treated as a crime by protecting against laws that target suspected homeless people because of their housing status, rather than their behavior. Local and state governments should make alternatives to incarceration and to fines and fees available at sentencing, and ensure that they accommodate the needs of people with limited access to public transportation, child care needs, disabilities, and other limitations. We’d all like to believe that if we’re facing challenges or even crisis, our community will step up and help us through, with respect and compassion. That’s how community should work – we share responsibility for each other and come together to face challenges. When people are experiencing poverty, homelessness, and other economic crises, they want what we all want: to be met with support, respect and compassion. However, the strategy of aggressively deploying police to address every level of community disturbance or problem, including relatively minor infractions, often means that people experiencing poverty and homelessness are met first by the police. This erodes community trust, further exacerbates the challenges that poverty and homeless already pose, and does nothing to increase community safety. Local and state governments should prohibit law enforcement from profiling individuals on the basis of perceived housing status and invest in more comprehensive long-term and short-term housing options; ensure that housing placements respect individuals self-identified gender specifications; improve police training on interacting with homeless communities, and enact an enforceable Homeless Bill of Rights measure that ensures that homelessness is not treated as a crime. Urge your local and state governments to enact policies that protect the dignity and rights of people experiencing poverty and homelessness. National Law Center on Homelessness and Poverty, an organization dedicated to eliminating the root causes of homelessness and addressing it in the larger context of poverty, which explores the criminalization of homelessness in their 2014 report, No Safe Place: The Criminalization of Homelessness in U.S. Cities.